In continuation of our Overcoming Hardship Series, we hereby take a closer look at the dangers Christians expose themselves to when they engage in Ponzi schemes. To lay the foundation for this post, you can click on the titles below to read the previous topics in the series. Christian, Flee “Whatever It Takes To Survive”! Christian, What Are You Doing On A Ponzi Scheme? There are many dangers of Ponzi schemes. I will just explain a couple of them and list others to prevent having an extra post on this topic. In Nigeria, for example, the Securities and Exchange Commission has repeatedly warned the citizens to steer clear of Ponzi schemes. The Central Bank has done so too. But because arrests and prosecutions have not been made, even students are getting brazen enough to float their own schemes. People forget that law enforcement is a process. Investigations are made, sometimes covertly, before suspects are picked up and Wilson Uwujaren, the spokesman of the Economic and Financial Crimes Commission, admitted to newsmen last year that the agency was keeping tabs on these fraudsters. Their ultimate destination is prison as was the case of Charles Ponzi himself, the ill-famed originator of the pyramid swindle. But the devil will always deceive some criminals into thinking they are smarter than the law. Even when you incarcerate them for something, rather than turning a new leaf, they come out and “finetune” their act. So it was that Ponzi, the “clever” scammer, went to jail three times for various terms and (died penniless in Brazil), a man who was once a millionaire! God’s standards have not changed and in case you still don’t know where I’m going with this, I fear when I consider what might be the fate of Christians in the event the authorities begin a crackdown on those engaged in these scams where they have not bothered them before. They might think they know where to hide, they may have many pastors praying for them, they may claim they paid their tithes on their proceeds, but God might ensure they are handed over to the authorities. It doesn’t matter their countries of origin or residence, God is the same all over and He will first blow the whistle on His stubborn children before the people of the world. It is also worth considering that people engaged in fraudulent activities make their family members, friends and associates subject to surveillance and questioning by the authorities. They might have to account for everything they own and will probably have a hard time convincing the authorities that they were unaware of and did not benefit from the crooked deals. Someone once told me that in a financial transaction, the power is on the side of the one who has the money. If you put your money in a bank, you can largely withdraw it when you want. It’s not so in a Ponzi scheme. The Ponzi thing is like a football game where the officials keep shifting the goal posts to keep the players from scoring. The lofty promises made can be changed without warning, creating panic and devastation. The real reason, though, was widely suspected to be the administrators’ fears that massive withdrawals in December would crash the scheme as public interest in it appeared to be waning. When they showed up this year, they introduced a tedious process that required “investing” more money to recover a fraction of previous deposits. Some of the money so trapped was borrowed or used without their owners’ permission, hence the desperation of the depositors. To date, some people are still holding out hope of getting the money back instead of cutting their losses and running. This can only push them further into disaster. These schemes are, therefore, likely to bring disappointment, despair, debt, desolation and even, death. 3. They are scams, no matter how well organised or how long they have lasted. They open people up to the spirits of gullibility and deception. 4. They breed greed and callousness. Imagine a believer thinking it’s okay to make a windfall, knowing fully well that some other people will suffer huge losses later! The Bible talked of people’s consciences being seared with hot iron (1 Timothy 4:2), making them impervious to compassion and correction. That’s a terrible state to find oneself in! 5. They foster unrealistic expectations (trashing the rules of sowing and waiting a reasonable length of time to reap as well as artificially magnifying the proportion of harvest). 6. They discourage industry (hardwork, inventiveness, sacrifice of time and energy to do a good job). 7. They consume time that should be invested in more meaningful activities. For example, I wonder what kind of grades students who are mired in these schemes will make. 8. They distract people from seeking sustainable means of livelihood. 9. Most frightening of all, like other sins, indulgence in fraudulent activities bring negative spiritual baggage into our lives making us deserving of God’s punishment and giving the devil legal grounds to harass us. Do not be deceived: neither the greedy nor swindlers will inherit the kingdom of God. Having been washed from these things, why are we returning to them like dogs to their vomit? Revelation 21:8 says in part that “all liars, their portion will be in the lake that burns with fire and sulfur, which is the second death.” Believers who promote Ponzi schemes, rather than preach the gospel; who persuade people to part with their money on the basis of the untenable terms promised by Ponzi schemes should, therefore, think again. Whatever doctrinal differences we may have about the eventual fate of believers who live in sin, the bottom line here is that God hates cheats and liars and He is never going to change His mind about that. Why are we risking being in the camp of those whom God hates? What can be the benefits of that? My brother, my sister, if you’re a Ponzi fraudster, how safe do these scriptures make you feel? My advice is that everyone who has participated in this evil should humbly repent and ask God for means of making restitution if they profited from it. We are living in the end times and we cannot keep running after fads that dishonour God and blur the distinction between us and the world. Matthew 7:20 states that “by their fruits ye shall know them” ((KJV). Our faith becomes suspect before the world when we profess Christ and continue to bear the fruits of wickedness. 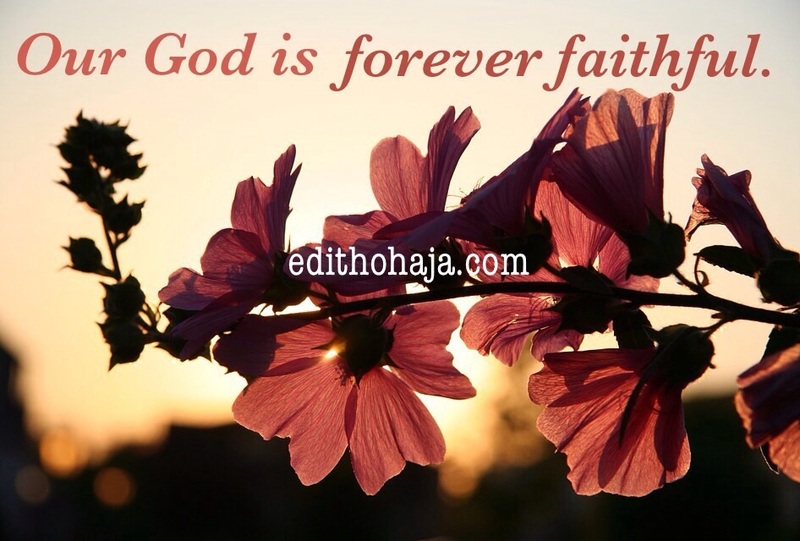 It is true that things are hard for many people, including believers, but we should walk in the steps of Jesus and allow God to prove His faithfulness to us. And He will surely do so in Jesus’ name. The next topics in the Overcoming Hardship Series explore what we can do to survive and prosper in spite of the hard times. CHILD OF GOD, YOUR LANGUAGE ON SOCIAL MEDIA MATTERS!!! If only we Nigerians will read and understand messages like this one. We need to build a thriving economy which will eradicate poverty and many social vices including online circulation of money for the good of Nigeria. Ma, nice post and God keep blessing you. Amen. Praise Gpd! May God bless you richly too in Jesus' name. Wow. Nice one Ma. Buh so many pple don't see it as sin. I for one hate the concept - risk bearing, pfft, only entrepreneurs take risk. I'm not one. Bless you, Justine! May God open their eyes in Jesus' name. This is a really educative piece. We Nigerians must learn to invest in things that will be of benefit to us and the nation at large in the long run and not short term unreliable stuffs like ponzis. How I wish everyone will think like you! You are richly blessed in Jesus' name. 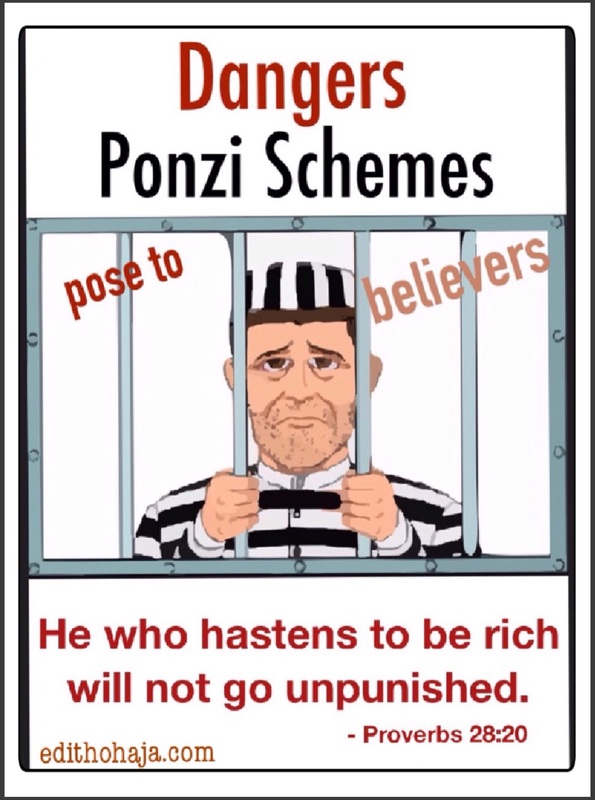 I'm not sure whether 'ponzi' is biblically wrong or not but I agree it has adverse effects like the ones mentioned in the passage and many more. As for legally, except it ends in a fraud, you can't sue. Just like the many betting sites openly advertising, ponzi hasn't been a secret practice. Our legislators stood up against mmm but could not indict Mavrodi. All the same, ponzi schemes should not be encouraged as it breeds laziness and unproductivity among able youths. Pushing others into loss and depression. It should be widely discouraged. Hi Ndudu! Maybe you should read the first part of this article, "Christian, What Are You Doing On A Ponzi Scheme?" where I gave two authoritative definitions of Ponzi schemes or you can check the definitions yourself or, better still, research Ponzi schemes for yourself. It's funny when you say "except it ends in fraud." It's a fraud to begin with (investment fraud), its ultimate goal is to defraud people and so perpetrators end up in jail when the authorities build a case against them. Ponzi scheme has done more harm than good in the life of Nigerians that have participated in it. Some have died and many are depressed due to the unfulfilled promises from many ponzi schemes. MMM taught me a great lesson, and ever since, I have tried to stay away from any form of ponzi scheme. The influx of these deceitful means of making money is becoming unbearable. So many ponzi schemes have come and gone in the past three months. But what surprises me is that in spite of all these, people still risk their money in new ones. I just hope people will get to understand that ponzi is fraudulent and desist from it. As for me, I was once part of it but I won't go back. May God help us all. Amen oh, my brother! Yesterday, someone said that some come and go in a week. The operators gather people's money, pay some and vanish with their "haul" leaving many in the lurch. This ponzi scheme is something that is very bad. It has caused so many problems to Nigerians and other people all over the world. Is not something that a true Christian should involve him or herself into. Thanks for making clear to us to know the dangers of this ponzi scheme through this article. And I pray that Nigerians will come out of it. Ponzi scheme has really eaten deep! It has caused so much pains and as such should be openly discouraged!!!!! Thanks for this! You're right, my dear! Let's join hands to dissuade people from engaging in them. You are richly blessed in Jesus' name. Ponzi, ponzi, ponzi. This is what is ringing in the minds of so many people especially the youths. I think we should first of all ask God to show us the way to make an honest living, not only that, but also to work hard when He has done that and He alone will crown our hard work with success as He promised. I just pray and hope that we all will come out of this ugly way of making money. D earlier Nigerians steer clear of this hit n run source of making money the better... Wonderful piece ? Praise God, DJ! Hope you are fine. Stay blessed in Jesus' name. God bless you too, my dear! The youth are said to be the leaders of tomorrow. What kind of leadership will they offer if they live on deception and lies? Thank you very much, Rita! I appreciate the visit and the kudos! Glory to God and abundant blessings to you in Jesus' name. Bless you, Lawrence! Moving over to how to actually survive the hard times and later, how to prosper in them. Used the first 3 posts in the series to talk about what not to do, so now to what we should do. Done with Ponzi, praise God! This is an educative piece! It is indeed true! I need to show my cousins this write up and only hope they will take heed. God bless u, ma. And bless you too, my dear! Ma, it depends on the way u see such because it has helped some people in Nigeria. but the truth is that it encourages laziness. Hi Victor! A lot of what I wrote in this post and the preceding one is not personal opinion. It's the law and the word of God. Beautiful piece ma Some people still may not understand this until it is too late. That's really sad! God help us all in Jesus' name. Ponzi Schemes! I was surprised the day i saw more than a hundred (100+) ponzi scheme sites posted in one group i belong to on Whatsapp last month. Though, ponzi scheme has helped many people in one way or the other, in which i have some of my friends as benefactors, the fact remains that the schemes are causing more harm than good in our society. I could remember the case of a UNN student who committed suicide due to ponzi schemes some months ago. Thete are many cases like that. It is my prayer that God should help and forgive us all. I must commend that graphic used for the piece, it is appealing to the eye. More of God's grace, ma. Lol, you like the graphic! Bless you for your wise words, Deacon! Nice write up ma.. Like you said in one of your comments, how can the youths who are the leaders of tomorrow still dwell on lies and deception.. This is very bad.. We the youths need to become clever and most especially God fearing.. We need to do the right and correct things.. Thank you for doing justice to this write up.. You are an inspiration to the younger generation..
Amen. God bless you, Osmond. Ponzi schemes are like brides with their veils on, you are excited and anxious and do not know what lies beneath. when u see other people raking in the cash, greed sets in and you want to follow suit and when you have invested and the site crashes, you now know the true face of the bride and start regretting. easy money can never be good money and never lasts. so the youths should beware as it is a strategy by the devil to turn u away from God..
Nice advice, Chiamaka! Thank you and God bless you richly in Jesus' name. God bless you too, my dear! Happy Easter in advance! Thank you for sharing this with us. Ponzi Scheme is not advisable. The money made from it may not even last. There is no elevator to success...we have to take the stairs. for me, i think indulging in ponzi schemes is wrong, but considering the kind of economic situation we are in, u cant realy blame people but the fact that we are Christians means that we should not engage in it. Ponzi schemes truly reflect the saying that all that glitters are not gold. although some people that ventured into it made a lot of money but the big question is: "is participating in ponzi scheme right? it is simply robbing peter to pay Paul. I pray that the good Lord will help us understand that which is evil and desist from it. Ponzi Schemes have really done more harm that good to Nigerians, and I think the growth of participants in it was due to the present economic recession in the country. It should be discouraged because it's breeding laziness, greed and crimes. Although some see the seemingly mutual help platforms as reliable and sustainable means of securing capital for business ventures when other means are not forthcoming. Also, some platforms that operate like Co-operate Society may seem intrinsically harmless, but one cannot be sure of future sustainability and mutual profitability of the schemes, especially the honesty of the Admins of the schemes. May we be wise to abstain. Co-operative societies are different and do not promise any windfalls. They are also not usually organised in pyramids and the operators are not faceless. Thank you for the deep explanation of ponzi scheme being a legal wrong. The mental and spiritual harms ponzi schemes bring are subtly damaging. One of my friends keeps talking about how she lost her peace when she got involved in it. Meanwhile, I'm in love with the graphics attached to this post. God bless you ma! Ponzi scheme is a bait. With this piece readily comes to mind the word of God that says, "Do not love this world nor the things it offers you, for when you love the world, you do not have the love of the Father in you." 1 John 2:15-17 This post is worth sharing. Well said, ma. Enlightening, truly enlightening. I still can't forget about all the money I lost in ponzi schemes. I finally learnt that money gotten from hard work is the best. A very big NO to ponzi scheme... There is dignity in hard work. ponzi scheme is bad. it wrecks one financially, it's addictive . believers shouldn't indulge in it. These points speak a lot on the dangers of ponzi schemes. A must-read for everyone to stop this ponzi madness. Only hard work really pays. Bible says money answers all things, the same bible made it clear that the love of money is the root of all evil. We must tell ourselves the truth if we must make progress. Beware of Greed. Get rich quick and loose the money even quicker. People are likely to spend faster and unreasonably without thinking of saving for the future, when the money so spent is one they never worked for. So, instead of living large for a very short period of time and then loosing it all before you even begin to think clearly, why not work to get the money yourself? No matter how little, you will feel safer and definitely spend wisely. Nice post, you know it's really annoying for one to have such a heart to defraud others in this hard economy, just to survive. It is the worst thing that can happen to anyone, many have gone to their early grave because of this crime. This is really sad. Most people who are into ponzi are the youths and all fingers are pointing to the fact that there are no jobs. Nice write up, ma. The Truth about this whole thing still falls back to idleness, impatience, and dead conscience. When one has got a good paying job, always busy with one thing or the other in regards to his/her work, I doubt that fellow would want to be involved in such game (ponzi schemes) because from what I heard it requires a lot of time and commitment. Every body is in a hurry to making quick money and catch up with the moving trend, our youth have leant to live their lives at the moment, ,(let's enjoy it now) forgetting that an ill gotten money remains ill . though its quite tempting, but please lets call a spade a spade, our society should as well help in fighting such temptation by providing job opportunities these idle youth in other to salvage the situation. They would never listen... I have told a good number of youths about this, but they all think it's the new "thing" I'm town.. So they should enjoy it.. Most youths are wasting their time on this and are not thinking about anything better. I pray God touches their hearts and change them. I need to share this post, they all need to see this and change. Thank you ma for the educative piece. People's drive to make money quickly is the end product of ponzi scheme. I know a lot of people affected by this disease eating into our nation. If only as individuals we can curtail our greed for money then we can sweep this disease away from our society.